My book is about 80% complete, and it has been that way for the past year. In fact, it’s already been to my editor once, and I have two things left to complete: expand on a chapter and finish the footnotes and bibliography. Yet for some reason, an entire year has passed by without me making much progress. I’ve maybe moved from 80-85% completion. Sure, I started a new job this past year. And yes, it kept me busy. But was I so busy that I didn’t have time to work on the book at all? No, probably not. Instead, I filled my schedule with less important tasks, which reinforced the lie that I didn’t have enough time. But why? Why did I keep putting something off that I knew was important? How come I prioritized other less-important items on my to-do list? The ugly truth is this: I feared failure. I like to think of myself as a recovering perfectionist. I am slowly starting to “loosen my grip,” and I’m learning to embrace the phrase “done is better than perfect.” But when it comes to big tasks… When it comes to major projects in which I’ve invested years of my life, that perfectionist manages to creep back in. And I’m telling you, she’s ruthless. So what gives? How did I overcome the fear of failure enough to get back to work? Good news: the answer is simple, yet incredibly effective. So if you want to learn my secret, read on. As I mentioned in my post, how to create a vision board, there is something powerful about the act of visualization. It has the ability to help you realize your intentions and turn your “someday dreams” into something that’s both real and achievable. But, what is visualization, you ask? Simply put, visualization is the act of picturing exactly what you want your ideal life to look like. How do you want to spend your time? What is your dream job specifically? How do you want your relationships to look? How do you want to feel in terms of your physical and mental health? You visualize your life down to the last detail, and you repeat this practice every day. First, visualize the best-case scenario surrounding the project that has you afraid. Allow yourself to dream about all of the wonderful opportunities that will come your way if you took that chance, started that project, or accepted that job offer. By practicing this visualization process, you see all of the incredible opportunities you might miss out on if fear maintains control. What’s more, you also boost your excitement about the opportunity, which further motivates you to get going. Okay, so we talked about the ideal situation, let’s also talk about the worst case scenario. Now, I realize this might seem counterintuitive, but bear with me for a minute. My if-then statement for writing my book is: If my book gets rejected with a note that says, “you’re a terrible writer!” then I will cry a bit (let’s be honest), look at the editor’s feedback, address the things with which I agree, and then reach out to another publisher. By creating a plan for the worst-case scenario you take away fear’s power and you can get back to work. I’m not going to lie, I thought my fear of failure surrounding this book was too big for positive affirmations. I didn’t think simple words were strong enough to silence those negative thoughts that play on repeat in my mind. I’m happy to report that I was wrong. Yep, positive affirmations are a powerful way to silence even the most negative, fear-filled thoughts and replace them with empowering and motivational beliefs. And it’s so simple to do! Every time those disparaging thoughts creep into your head, simply shove them aside with a positive affirmation. My hard work is worth it. Once you create your affirmations, then keep them front-and-center in your mind. Put them on post-it notes and stick them around your home. Paint them on a canvas and hang them on your wall. Do whatever it takes to keep these positive messages flowing into your mind at all times. Because the sooner you embrace these truths, the sooner you’ll silence that fear and start reaching your dreams. So what do you think? 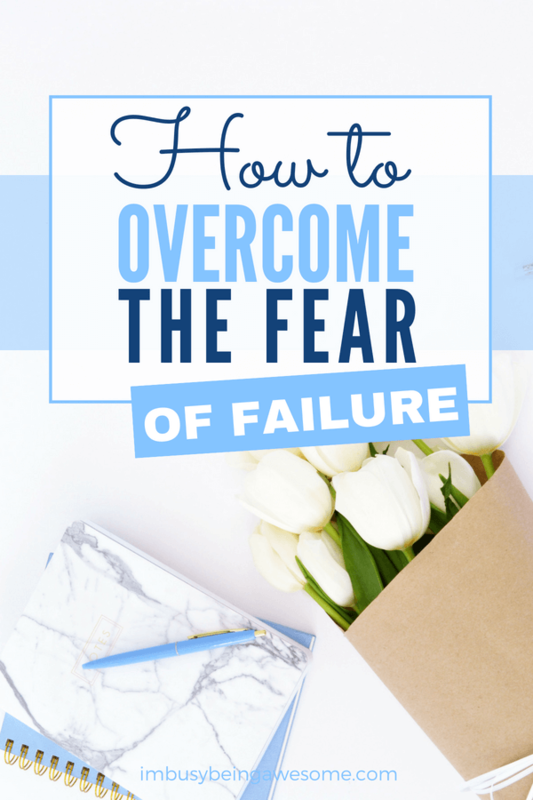 Are you ready to overcome the fear of failure? Are you ready to take the leap and start living your life? Then give these three strategies a try. And be sure to download this list of 40 positive affirmations, which will help you kick fear to the curb even quicker. 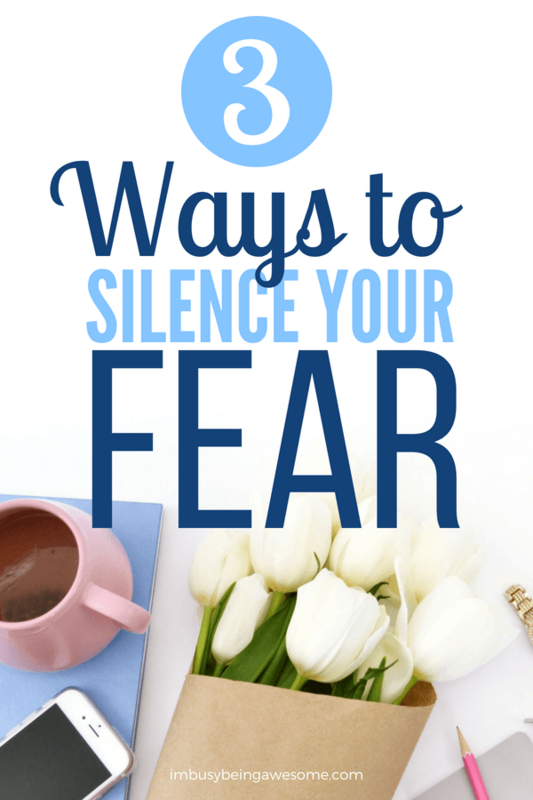 Has fear ever stopped you from “going for it?” Do you practice positive affirmations? 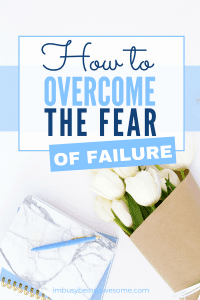 How do you overcome the fear of failure? Let me know below! That being said, I agree with you that positive affirmations and visualizing the end result and how your life will look are far more powerful than any of us realize. And your timing is perfect–this post came exactly when I needed it. These are wonderful affirmations. Fear can really get you down. It’s good to make the most of it! Oh, man. I really needed this today. I think one of my biggest fears has always been failure and I don’t deal with it well, so this was great! I took a little bit of a break from blogging over the summer and in the last few months when I haven’t been as consistent, that annoying little voice keeps popping and asking “Is it really worth it? Are you really making a difference?” I’m trying to push through, but it can be hard! I need to be better about employing these tactics! That negative voice can be quite strong, can’t it? Don’t give in; you got this! I can see how you hot that wall with 20% more to go on your book. The fear of failure has a way of creeping without us knowing, doesn’t it? Great tips on overcoming failure as it hits us more than we probably want to admit. My fear of failure is paralyzing sometimes and it is definitely difficult to come back from it when it hits. These tips will definitely come in handy. It’s amazing how powerful fear is, isn’t it? I hope these tips help, Leigh! It’s great to have goals to try to achieve and the ability to overcome our fears. Thanks for the advice, it is helpful to be able to pursue things without being hindered by a fear of failure. This is fantastic advice. I do the worst case scenario for myself as well and that helps so much when I’m trying to work through anxiety and fear! Fantastic post! I totally agree with all of these points to overcome fear- not just of failure but of many things! This is awesome! I always say if you haven’t failed at something then maybe you’re not trying hard enough! Yes! I love that mindset, Lori! Waiting impatiently to read your book! Go, Paula, go! In my past work with clients, I saw this sooooo often; avoiding tasks to avoid the possibility of failing. But usually it is difficult for people to see that’s what’s happening. How helpful that you can identify the tendency yourself… and even better that you have this 3-part strategy to move forward. I’m sure this will be inspirational to many. So glad you shared! Thank you, Julie! It’s true, so many of us struggle with this fear of failure with some aspect of our lives. I hope this guide helps! Absolutely, Yolanda 💞 It’s sometimes hard to pinpoint what’s really holding us back. And our minds are so good at making us believe the mundane tasks are actually important. Sometimes I just keep asking myself “why” to every excuse I have, which helps me dig deeper into the problem and find the source. ‘Why do I think doing X [mubdane task] is more important than working on the book?’ Because I can get that done faster and feel a sense of accomplishment. ‘Why is it more important for me to feel quick gratification than work on this larger-project?’ Because when I don’t get things done quickly, I feel like I’m not good at them.’ Etc… Usually, it all stems down to fear in the end. These are such great ideas. I often don’t try something I’m not sure I’ll be good at. I’ll keep these tips in mind! I too am always trying to silence the “inner voice”! I love when you mentioned that positive affirmations are a powerful way to silence even the most negative, fear-filled thoughts and I am going to try that from now on! I can really relate to this. I have some ebooks I have been wanting to create and always say there is no time but I use time on less important busy work rather than investing in myself. I completely relate to this! I’m the same way. I’m excited to start things but afraid I’ll fail, so completing them takes a little longer than I plan.